Road signs are signs erected at the side of or above roads to give instructions or provide information to road users. Familiar with symbols on road signs is important for every road user in order to maintain the safety and efficiency of our body and transportation facilities. 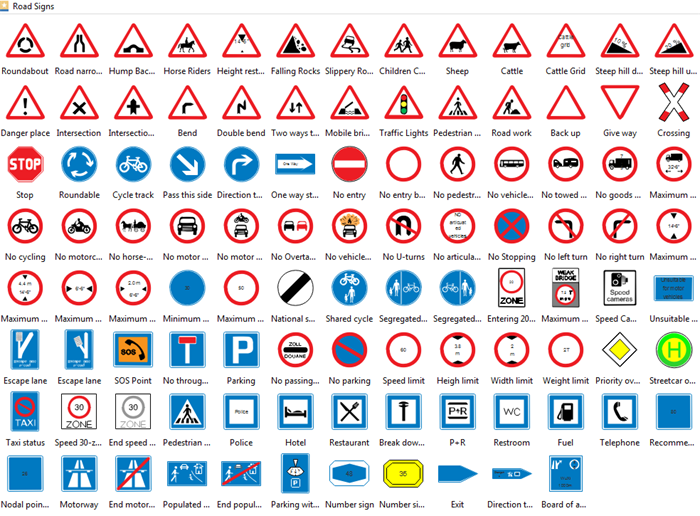 There are more than various 100 road signs in the libraries of Edraw infographic software. Just like below picture shows. All of them are most commonly used in road ways. Except for these signs, Edraw also provides many other infographic elements for different uses and a set of drawing tool for users to create their own elements. All the road signs are editable. Users can change the colors, dimensions, directions and group/ungroup these elements according to different situations. See below road signs application and know road signs better to prevent unnecessary accidents. Want to use the above road signs elements in your infographics? Download Edraw Infographic Maker! It includes a large variety of road signs shapes which are easy to modify. Design a wonderful infographic is just a few click away. Try it now!